“Yosemite Valley, Glacier Point Trail,” the grand 1873 landscape painting by Albert Bierstadt, anchors a new exhibition on view at the Yale University Art Gallery celebrating the cherished national park’s legacy as a source of inspiration for artistic endeavor and scientific discovery. 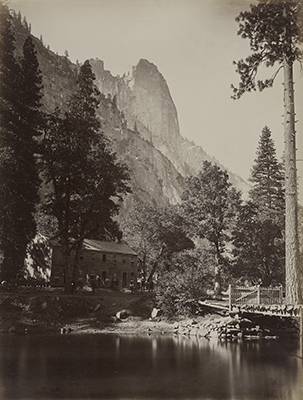 The exhibition, “Yosemite: Exploring the Incomparable Valley,” marks the 150th anniversary of Yale’s Peabody Museum of Natural History as well as the 100th anniversary of the founding of the National Park Service. It is on view through Dec. 31. 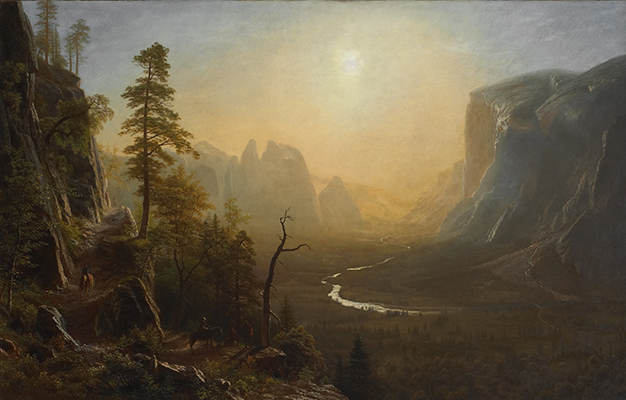 Bierstadt’s vista looks west from about midway through the Yosemite Valley. El Capitan’s 3,000-foot cliff face towers to the right. The Merced River winds through the valley’s floor. A sunset bathes the landscape in warm, golden light. Tourists on horseback in the painting’s lower left corner soak in the view from the trail. The exhibition draws on the gallery’s collection as well as those of the Beinecke Rare Book & Manuscript Library, Sterling Memorial Library, the Yale School of Forestry & Environmental Studies, and the Peabody Museum, which has more than 13 million related items in its collection. In 1864, while the American Civil War raged, President Abraham Lincoln signed legislation granting the Yosemite Valley, which was federal land, to California to be protected in perpetuity. 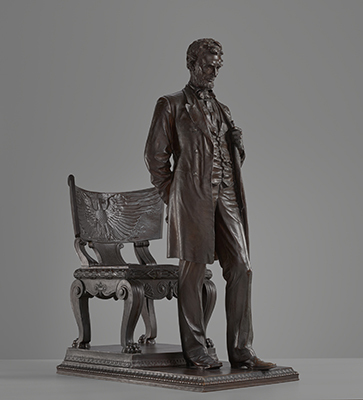 Augustus Saint-Gaudens’s bronze memorial of Lincoln, a reduction of the version in Chicago’s Lincoln Park, greets visitors to the exhibition and honors the 16th president’s role in Yosemite’s preservation. When Yosemite became a National Park in 1890, the land was restored to the federal government and greatly expanded to include surrounding mountains and forest. In 1906, President Theodore Roosevelt signed legislation expanding the park to its current footprint of nearly 750,000 acres. While Native Americans have resided in Yosemite for several thousand years, European Americans discovered its marvels in the early 1850s. The exhibition’s first section displays the latters’ early attempts to document the valley’s beauty. Prints on view by Currier and Ives, a New York City-based lithography firm, depict a romantic, generic, and simplistic view of the landscape based on written accounts. 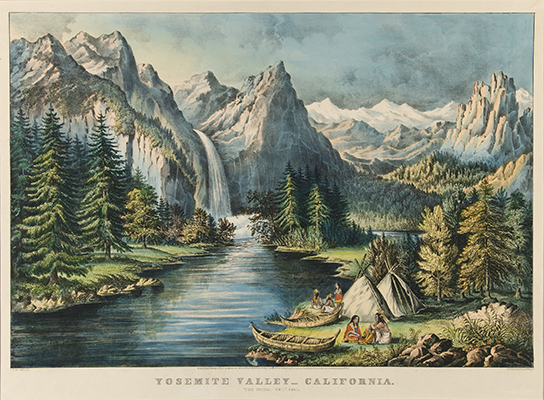 Watercolors from the Beinecke Library by James Madison Alden in 1859 provide an early firsthand visual record of several of Yosemite’s geological features from the valley floor. 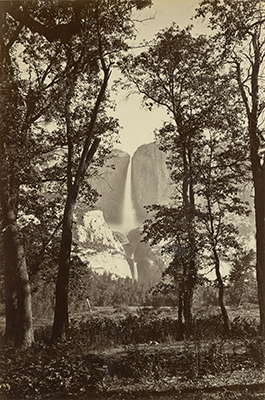 Photographer Carleton Watkins’s large-scale photographic prints of the Yosemite Valley provided the first expansive and panoramic views of the landscape, capturing its enormity and splendor, Mitchell said. Mitchell said it is believed that Lincoln studied Watkins’s photographs while considering the 1864 legislation. 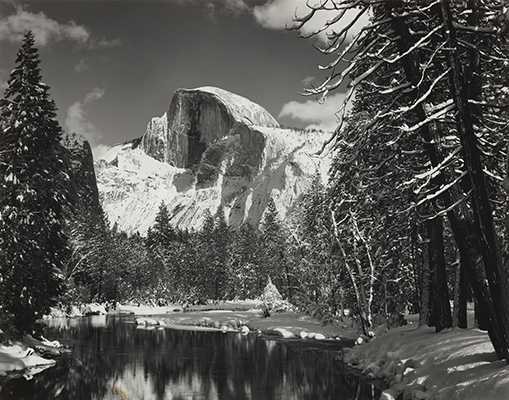 A selection of Ansel Adams’s photographs depicting Yosemite’s majestic vistas, reflect Watkins’s influence, Mitchell said. 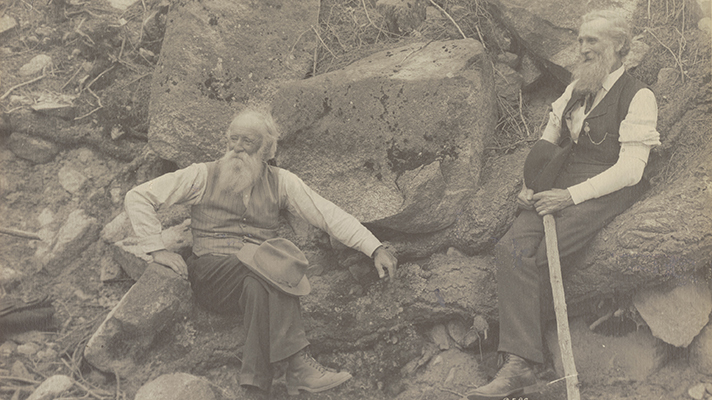 He called Watkins and Bierstadt “the two visionaries of the valley” as their depictions of the landscape captured the public’s imagination and inspired people to visit Yosemite. A selection of hand-woven baskets made at the turn of the 20th century by artisans of the Miwok people, drawn from the Peabody’s collections, show one way in which Native Americans engaged with tourists to make a living. 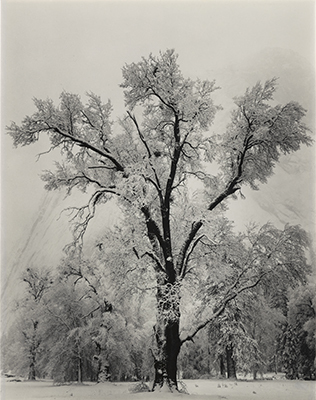 The exhibition’s second section explores Yosemite’s status as a massive open-air laboratory that generations of scientists, much like artists, have visited in order to record and understand its geology, botany, and wildlife. Visitors are invited to view Bierstadt’s painting from a unique perspective — one that incorporates plant specimens from the Peabody. Specific trees are identified in Bierstadt’s landscape — ponderosa pine, sugar pine, white fir, and greenleaf manzanita — and matched with a corresponding specimen from the Yale University Herbarium, which is housed at the Peabody. A stereo card offers another perspective on the painting: It shows women on horseback in 1900 climbing the Glacier Point Trail, providing three-dimensional sense of what it is like to encounter the vista in person, Mitchell said. Several of the botanical specimens on display were collected at Yosemite, including specimens used to name specific species, such as the sword fern. Geological specimens taken from the El Capitan formation are on view for visitors to touch. Peabody Director David Skelly, the Frank R. Oastler Professor of Ecology, said the exhibit seamlessly captures the intersection of art and science. An 11-foot, 3-inch long core sample taken from a 1,300-year-old redwood tree closes the exhibit. The sample, collected in the mid-20th century by members of the Yale School of Forestry, provides the tree’s radius — the distance from the trunk’s center to the bark. The core sample is used as a timeline. Dates ranging from about 650, when it is estimated the tree began to grow, to 1863, when Bierstadt first visited Yosemite, to 1950 when the core sample was taken, are marked on the wall. A footprint of the tree’s diameter is marked on the gallery floor. The Yale University Art Gallery, located at 1111 Chapel St. (between York and High), is open to the public free of charge 10 a.m.–5 p.m. Tuesday-Friday; until 8 p.m. on Thursdays from September to June; and 11 a.m.–5 p.m. Saturday-Sunday. It is closed Mondays and major holidays. For more information, visit the museum’s website. The Yale Peabody Museum of Natural History celebrates its 150th anniversary on Saturday, Oct. 22. The museum has a series of initiatives to mark this special occasion, including the opening of David Friend Hall, a cutting-edge gem and mineral gallery. For more information, visit http://peabody.yale.edu.